Everything is sorta the same, but different, you know what I mean? Whether it is the stuff we face as individuals: mid-life crises, trying to maintain a healthy work-life balance, a prioritisation of the material and the intangible; or the issues we face as nations: a shift in population demographics towards an increasingly ageing population, the rising cost of healthcare on national coffers, corporate greed; there is a certain puzzling characteristic about these “#firstworldproblems”. They feel so inane at times, especially when compared to the challenges faced by developing countries. Challenges such as famine, war or poverty, which have plagued us since the dawn of creation. First-world problems seem unique to our time, yet are similar to third-world problems in that they are fundamentally driven by the same primeval forces of self-interest and greed. What makes most first-world problems feel unique is the adjustment we have had to make because of a significant shift in our perception of time. The undeniable fact is that we now have more time. On the converse side, we are increasing the speed at which we live our lives. We demand faster promotions as we climb the corporate ladder. We have an endless barrage of information and data fed to us through multiple channels and devices. We want to get to the good life earlier in our lifetimes than the generations that have preceded us. So on one hand, better healthcare has given us more time, and on the other hand, the demands of city life have compressed time, enabling us to reach desired standards of living earlier, achieving more in a shorter time when compared to our predecessors. What have we done with all that extra time saved? Do we pursue ever-increasing standards of living, filling our lives with more material things, only to feel enslaved to work longer in order to fuel the demands of a high-maintenance life, fearing that life itself will stretch beyond our means? Or do we live more frugal lives, investing the excess time in charity, or solving the problems of developing nations? There have been recent discussions about how privileged first-world inhabitants should not arrogantly portray ourselves as saviours of those living in the third-world. I was initially a little apprehensive at condoning a slowdown in efforts to tackle issues faced by millions who live in developing countries, but a little introspection revealed to me where those authors were hinting at. Maybe the developing countries aren’t the only ones in need. Maybe we are the impoverished. Maybe we are the ones who are starving. Maybe, just maybe, we are the ones in need of saving, for surely we have, in our quest to evade physical death, lost our grasp on the value of life. We have forgotten the joys of parenthood and the warmth of family. In the first-world, we speak more often about “the cost of raising a child” than the intrinsic rightness of having children. We no longer revere our aged as wise and deserving of respect, but bemoan the fact they are no longer economically productive and are a “burden”. We have gained the most precious thing in all the world: time, and we have absolutely no idea what to do with it except complain. The battle, enshrined in Kennedy’s famous words, “against the common enemies of man: tyranny, poverty, disease and war itself” is a rallying cry for us to help our brethren in need. But we enter the fray not because we are saviours heaven-sent, but because it is in this same battle we put to action our convictions; where we stave off a first-world amnesia and rediscover the important things in life, restoring the sanctity of time with a life well-lived. Living on an small island that deems itself a megalopolis, it is not easy to find places to pull back from the city’s pace, observe things from a distance and recharge. It is probably wiser to never blog about these places and hide them away from mainstream attention, but some things are so beautiful they are worth sharing. Everyone think that the Gardens by the Bay project only opens next year, so not many know that part of the Gardens has been open to the public for some time now. 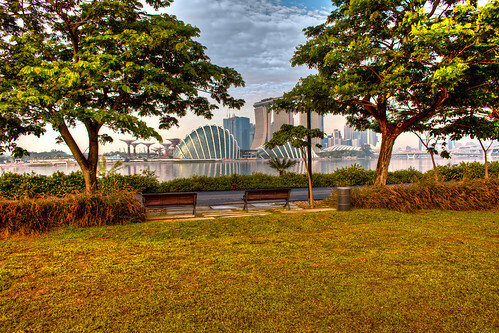 Faith and I serendipitously stumbled on the Gardens by the Bay East, across the water from the main Gardens, during one of our bike rides around our home. Imagine our excitement when we rode beneath the Benjamin Sheares bridge and found a green oasis with an amazing view. We rode all the way to the end and were thrilled to discover that the Gardens were linked to the Marina Barrage. We’ve always wanted to go to the Barrage, but it used to be terribly inaccessible without the use of a car. Now that we could ride there on our bikes, I planned to make it one of my routes to work. 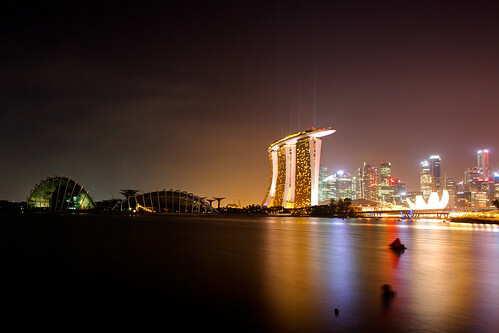 The night view at the Gardens East is arguably even more astounding. 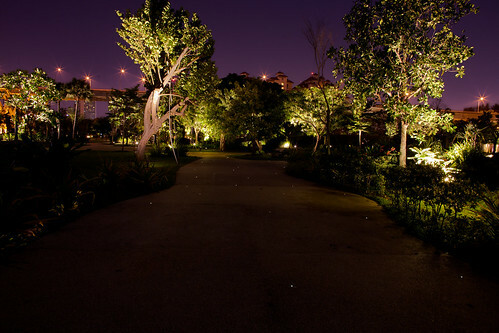 When you walk into the Gardens at night, the footpath is lit up with tiny twinkling lights so you feel like you’re walking on a belt of stars. My photos don’t do it justice. You really need to be standing there to experience the wonder. 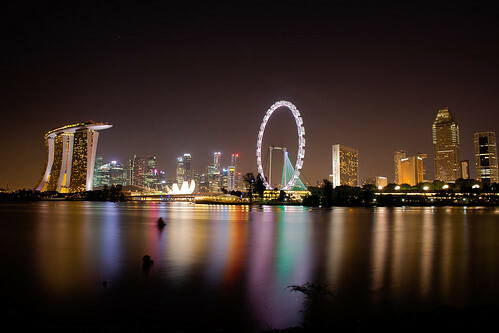 Watching the nightlife of the city from the quiet and breezy corner of the Gardens by the Bay is invigorating. 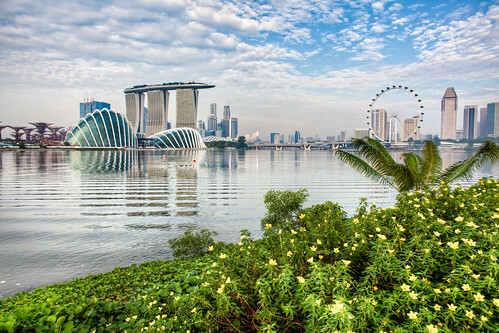 The contrast between the exciting city and the quieter gardens is probably best visually represented by the juxtaposition of Gardens by the Bay South and the Marina Bay Sands. It probably isn’t the wisest thing telling everyone about my nice quiet corner. But as always, when the crowds start swarming, I’ll be looking for my next fortress of solitude. I stepped into the auditorium of the Singapore Chinese Chamber of Commerce and Industry, and felt a little out of place. Mum had sent me an email two days earlier about Claire Chiang’s new autobiography “张齐娥登陆记”. I thought then that it would be interesting to turn up at the book launch to hear what one of Singapore’s most active civil activists had to say. Standing in a sea of people whom I could only instinctively describe as “decidedly Chinese”, I felt a little out of my comfort zone. Like many others of my generation, we were brought up by English-speaking parents. Learning the Chinese language was a daily travail that plagued our educational journey. Looking back at how I struggled to pass the language year after year in school, it would only be logical to assume that I’d grow to hate my mother-tongue. It was only after spending many years in a bilingual church that I’ve come to fear the Chinese language less. But this night would give me pause. As I stood alone in the crowd, conversations streamed about me in extremely fluent Mandarin. I found a seat in a corner, sat myself down and pretended to have an engaging conversation with my mobile phone. It might have been the fengshui of that particular corner in the auditorium - a group of English-speaking folks sat around me. Paul Rozario from the Arts House introduced himself and sat beside me. The event began. Speaker after speaker went on stage, delivering their speeches in Mandarin. They recounted their relationships with Claire, the person she was, and the amazing life she led. What was fascinating was that I found myself translating the speeches to Paul. It just came so naturally. I wasn’t about to let someone sit through an entire event without enjoying these testimonies of Claire’s younger days, or the accounts of Claire’s children. As I translated I found myself enthralled by the beauty of the Chinese language when wielded fluently. Trying to retain that beauty while translating, while no mean feat, was a challenge I intellectually relished. Paul’s appreciation of the intricate Chinese expressions (however callously mutilated by my substandard translating) touched my heart — this is the Singapore I want my children to inherit. A place where we can be proud of our ethnic identities, express them openly and share them freely with others. A place where we can have access to the richness of other cultures and be made better through the appreciation of the unique and the realisation of the common. As I walked home after the event, it dawned on me that while I was translating cross-culturally, Claire’s speech and her book was an effort to communicate the values of her generation to mine; showing us that attributes like truth, virtue and beauty are timeless, and that more of us ought to be protecting these treasures against an increasingly mercenary and selfish mindset.